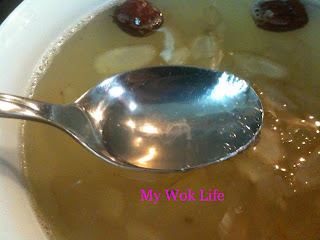 Time to pamper yourself with luxurious bird nest dessert! My mum got me some of these unprocessed original bird nests of the home-bred swallows. That was my first time seeing the raw bird nests. Unlike those already well-processed with machine types which also moulded very beautifully in standard curve shape and size, these raw bird nests were full of feathers and dirt, and never in uniformed shape and size. To be franked,I couldn’t imagine the delicious cooked bird nest dessert was made from these appealing raw ones…. I heard bird nest is rich in amino acids which reqiured by our body. Eating bird nest regular helps to improve health condition and it is the best food for more radiant and smoother skin complexion for women, while it helps strengthening lungs and kidneys for men who take bird nest on regular basis. 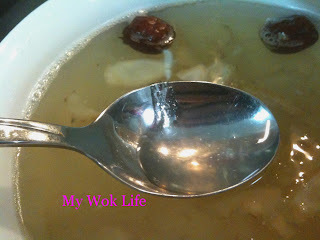 For young children, bird nest helps to boost up immune system. As for myself, I am more concern on promoting fairer and smoother skin. Not sure if I am over-sensitive, I do feel that my complexion is better after having my homecooked bird nest every week for the past 1 month (laughing). And, it is the best to have the unprocessed types of bird nest to avoid any chance of taking the bleaching chemical substance during the process of cleaning the bird nest goodness for better commercial value. I convinced myself with this reason, and started to do the cleaning, all manually. It was indeed tedious and very long a process to get every single tiny feather, dirt and any other excrement out of the hard and dry nest, but they worth it all! 1. Soak the dry curvy bird nest in a large bowl of luke water till soften, about 1 hour or more. 2. Drain and remove softened bird nest from large feathers and dirt. 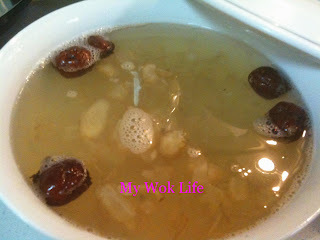 Place bird nest in a large bowl of clean water. 3. Repeat step 2 for a few more rounds to get rid of all the large dirty substances. 4. Prepare another separate bowl of water and a sharp tipped ear tweezers to pick up those tiny feather and dirt that are still in the bird nest. To easily remove the tiny feather that sticks on the tip of the tweezer when you picked up, submerge the sharp tip into the bowl of water you have prepared separately. 5. Drain bird nest and change to clean water constantly during the few cleaning stages. You may also separate the cleaned portions out of the large bowl, and place them in another bowl, little by little. 6. Complete the cleaning process till the bird nest is totally free from feather/ dirt. It might take up to 3 hours to complete the task. Now, ready to cook this goodness which should already be in a form of transparent jelly-like thin strands. 1. Place water, ginseng slices and red date into a ceramic bowl/ croak pot (the size of the bowl musn’t be too small, water level should reach max. till three-quarter filled to avoid spillage). Bring it to a boil in double boiler or slow cooker, with medium heat. When water is boiled, reduce fire/ switch to low heat and simmer for 2 hours. 2. Add clean and soften bird nest and white rock sugar into the bowl/ croak pot, and continue to simmer for another 45 minutes. 3. The fragrance of egg white-like scent will emerge in the air, by then. Ready to serve hot, or store in refrigerator when it’s cooled at room temperature, to serve chilled later. The top-graded bird nest should be able to cook into loose crystal clear strands. And its texture should be soft and silky, resembling jelly strips. I loved to have it chilled as it tasted more refreshing. Bird nest is low in calorie. So, it is alright to have it regularly! Tips: Every single feather in the raw bird nest has to be cleaned away, especially if this is to be consumed by young children. * Unprocessed bird nest was gotten from neighbourhood country. ← Julie & Julia – A great movie for Food Lovers. Bloggers. Life Inspiration Seekers. Interesting posts you have here … I can see that you put a lot of hard work on your blog. I’m sure I’d visit here more often. Thanks for your visits and I welcome you. I shall keep it on if more of you like and support it..
hi ,thanks for sharing .